We (Well I!) decided it was going to be an ideal weekend to leave the harbour and venture over to the Isle of Wight. 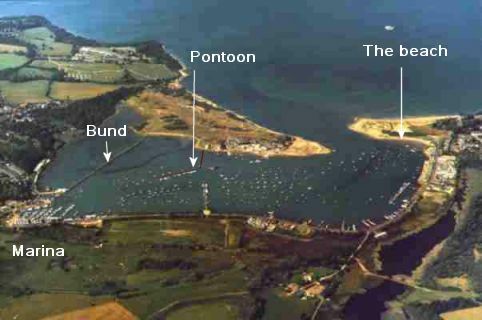 From the entrance of Chichester harbour, Bembridge is about 8 miles south/south west. So around 2hours sailing time. Unfortunately, due to the Goodwood festival of speed being on this weekend, it took us longer to get down to Northney than usual. We did manage to avoid most of the traffic by jumping down the lanes south of the A27, but unfortunately took a wrong turn and ended back in the traffic for a long 100 yards! HW was 13:26 at Northney; we finally set off around 13:00. The wind was almost due South, but a lovely force 2/3 and the sky was clear. We tacked our way down the Emsworth channel and out into the Solent. We were able to set a course beating to windward across the Solent, and managed to keep the boat speed to a healthy 5.5 knots. We arrived in Bembridge about 16:30, with very little water left (about 2-3 feet over the bar :-), so we raised the keel and rudder and motored slowly down the winding channel to Duver marina. The pontoons were all around 5/6 boats deep, and we were allocated a space tucked in alongside a Vancouver 28. But first we had to tuck ourselves in. I motored past the stack and reversed into the gap. We ate tea, and then took the children ashore for a run. Then back to bed for a 10pm bedtime. Waking up at 8 on Sunday, to a bright clear but windless morning. We ate breakfast, and could see that hanging around was going to be a problem, as by around 11am the boats on our inside would want to go, so leaving the boat was a bit of a non starter. So at 10am we slipped, and left well ahead of the crowd. We motor sailed back across the windless Solent, The sails adding a knot or so to the overall speed. We arrived back in Chichester around 12:30, and snuck our way into a very crowded East Head. As high water was not for a couple of hours, we lifted the keel and went in close to the shore. BBQ ashore for lunch, and we left around 15:00 back to Northney. finally arriving around 16:30. A bit of an adventure, and lots of lessons learned, it was too long on the boat for the children, they needed to get off and expel some energy. Realistically 2 hours is the most they can do in a single stretch. And being somewhere without easy shore access is a real pain. However my son finally started to get over his phobia of the boat heeling even a few degrees. He spent the afternoon with my elder daughter on the leeward rail dangling his feet in the water when the boat heeled! Overall a very tiring but enjoyable adventure. This blog is about Stargazy, our first leap into bigger boat ownership. I've been sailing for around 30 years now, and have sailed in various dinghies (Topper, Enterprise, Wanderer, Comet, Miracle, among others!) and also on various Yachts. I've sailed mainly on the south coast of the UK; Chichester Harbour, the Solent and Poole all being favourites. My first steps afloat were taken on the Norfolk Broads, somewhere still dear to my heart. Before we had children (BC!) Jan and I did some bare boat charter in Greece and Turkey with friends. I've also sailed to the Channel Islands and on various boats in the Solent. Our focus now is on family sailing with our son and two daughters. Time will tell if they have salt water in their veins! I'm an IT Director, having worked in Software development for over 15 years. I run a software development company, working with a variety of organisations helping them to achieve their business goals through the use of IT. I'm married with 3 children and live in Sussex. Copyright Daniel James / Northwind 2011. Simple theme. Powered by Blogger.